This is the point at which sanctuaries need to be mindful that they do not ease the conscience of the backyard keeper by providing an unchallenging solution to his dilemma, thus allowing humans to continue the cycle of animal use by taking in younger, more ‘productive’ animals. For this reason Eden has a strict protocol about the intake of residents and vegan education is mandatory for the humans who leave animals here. Our latest residents came from more benign circumstances. Their keeper became ill and was no longer able to care for large animals, although he and his family will continue to care for smaller animals. This was a situation where there was a genuine human:other animal bond, where the members of both species cried at their parting. Sanctuary managers need to be very careful that they do not, inadvertently, allow their sanctuaries become repositories for irresponsible small holders or back yard animal keepers. Until humans awaken to the entitlement of other animals not to be our property, the human:other animal relationship will be based on their utilitarian value to us. While most animal keepers find this relationship of use acceptable, especially those who keep other animals for companionship, show, milk or eggs, their conscience disallows them to take another animal’s life simply because their utilitarian value has declined. Participation in their murder takes place at a safe distance, when their dead bodies are shrink wrapped on supermarket shelves, their personhood gone from the barely recognisable muscles and bones of their remains. So, although many smallholders cannot countenance ending the lives of those they keep, neither are they willing to pay for their upkeep in their later years without some secondary gain. This is the point at which sanctuaries need to be mindful that they do not ease the conscience of the back yard keeper by providing an unchallenging solution to his dilemma, thus allowing humans to continue the cycle of animal use by taking in younger, more ‘productive’ animals. For the individual who is rescued and comes to live at Eden, the circumstances of how they got here are irrelevant. Yet, many have come here because they were no longer of use to those who kept them. If sanctuaries ease the conscience of animal keepers by somehow giving them the impression that they are doing a good deed at the end of the animal’s life by letting someone else take care of someone they have made use of, then the ultimate goal of abolition of animal use is sacrificed. For this reason Eden has a strict protocol about the intake of residents and vegan education is mandatory for the humans who leave animals here. Our latest residents came from more benign circumstances. Their keeper became ill and was no longer able to care for large animals, although he and his family will continue to care for smaller animals. This was a situation where there was a genuine human:other animal bond, where the members of both species cried at their parting. Let me introduce you to the first goat people to arrive at Eden. 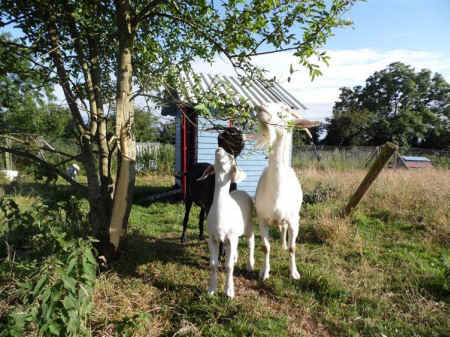 Pixie and Molly are five years old; they arrived with Pixie’s children Richard and Frank. 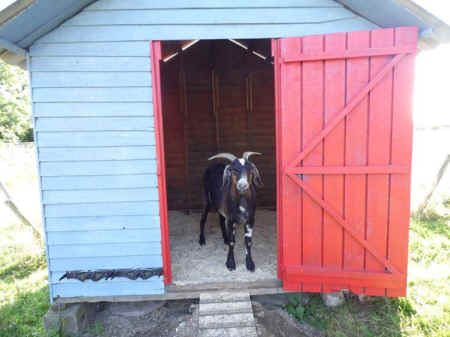 Pixie is the more dominant goat; Molly, with her genetically inherited crooked, but beautiful, face, is more timid. A tightly knit group, the kids, Richard and Frank, are almost as close to Molly as their mother. This rescue presented an opportunity for vegan education which was received openly, enthusiastically and gratefully; the family left armed with abolitionist vegan literature, as well as several sources of information on the intersectional issues of animal sentience, human health, the environment, and workers’ rights. It is our fervent hope that not only have four lives found sanctuary at Eden; at least three human lives may have found the peace of veganism. 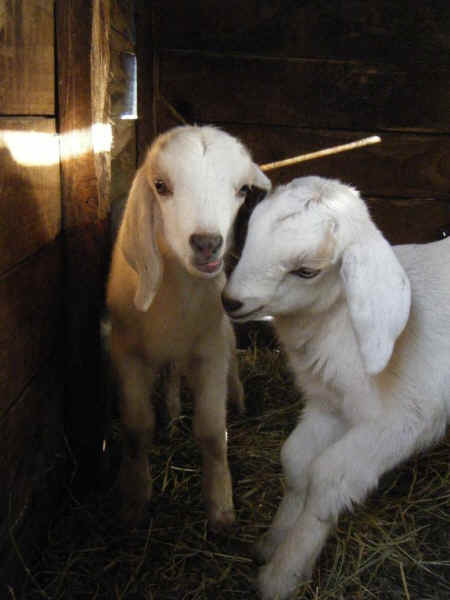 These goats faced a precarious future and the likelihood of being separated until they found Eden. 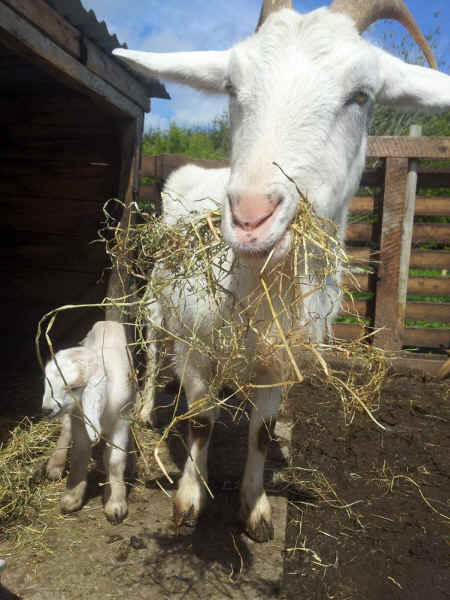 They are now safe from human use; the mother child bond between Pixie and her kids is secure and can flourish. Pixie and Molly will never again bear kids or be used in any way. I know that the Friends of Eden will want to join me in extending a warm welcome to them and together we will look forward to getting to know these ambassadors for all goats worldwide whose personhood is unrecognised by those who use them for their flesh, milk, and skin.